Pave the Way Foundation is a nonsectarian organization whose mission is to end the malevolent use of Religion. By initiating positive gestures between the faiths and other organizations, we create foundations of trust from which we identify and work to eliminate non theological obstacles. These historical successes have enabled us to work to improve cooperation, tolerance and understanding between the religions. Embrace our Similarities Savor our differences. The meaning of our slogan is simple. We must embody the messages of charity, love, and responsibility for every human being, common to all of our faiths, our beliefs and to the code of human behavior. We focus on our similarities and savor our differences by learning, through the positive and practical appreciation of the World's diverse religions and beliefs. We must not allow the differences to poison us, with bigotry, hatred, and intolerance. Instead, we wish to learn, enhance our own beliefs and in turn savor our differences. 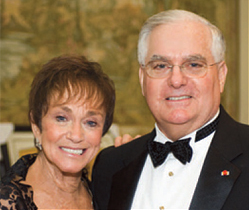 Pave the Way Foundation was co-founded by Meredith and Gary Krupp in 2002. Gary Krupp is uniquely suited to bridge the gap between religions. Gary is the only Jewish man in history to be knighted, by Pope John Paul II, raised in rank by Pope Benedict XVI to the Order of St.Gregory, and invested by permission of Her Majesty Queen Elizabeth as an Officer Brother in the Anglican Order of St. John of Jerusalem. Being a trusted member of the Papal household has enabled him to act as a catalyst in initiating changes and eliminating many obstacles to the furtherance of Judeo-Christian relations.